Peripheral Arterial Disease–PAD–is a common, yet serious, disease. It occurs when extra fats and cholesterol circulating in the blood collect in the walls of the arteries and reduce or block the flow of blood to your limbs. PAD is most commonly seen in the legs, and nearly everyone who has PAD suffers from an inability to walk as fast or as far as they once could. Early treatment of P.A.D. can restore your mobility, decrease your risk for heart attack and stroke, and possibly save your life. Often, people experiencing symptoms of PAD–like pain or cramping in the legs–do not report it because they think it is a natural part of aging. Plaque buildup in the arteries that supply blood to the limbs is the cause of PAD, as shown in the illustrations at the right. In many cases, however, the exact cause of this buildup is unknown. Besides the unknown factors behind plaque buildup, there are also several conditions and habits that raise your chance of developing the disease. Some are preventable. Others are not. Arteries are blood vessels that carry oxygen and nutrients from your heart to the rest of your body. 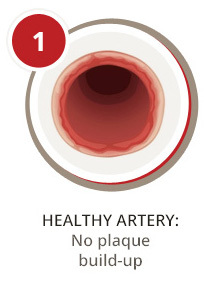 Healthy arteries are flexible and elastic. Over time, however, too much pressure in your arteries can make the walls thick and stiff — sometimes restricting blood flow to your organs and tissues. This process is called arteriosclerosis, or hardening of the arteries. 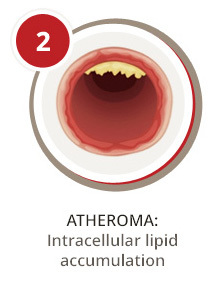 Atherosclerosis is a specific type of arteriosclerosis, but the terms are sometimes used interchangeably. Atherosclerosis refers to the buildup of fats and cholesterol in and on your artery walls (plaques), which can restrict blood flow. These plaques can also burst, triggering a blood clot. 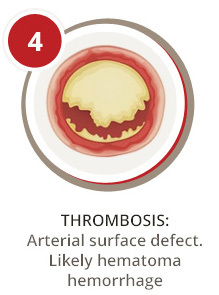 Although atherosclerosis is often considered a heart problem, it can affect arteries anywhere in your body. 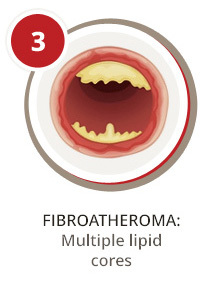 Atherosclerosis is a preventable and treatable condition. 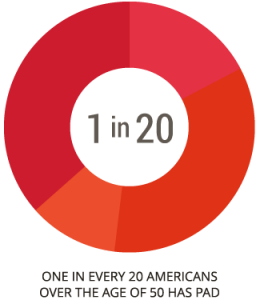 One in every 20 Americans over the age of 50 has PAD, a condition that raises the risk for heart attack and stroke. Peripheral arterial disease (PAD) develops when your arteries become clogged with plaque—fatty deposits that limit blood flow to your legs. Just like clogged arteries in the heart, clogged arteries in the legs mean you are at risk for having a heart attack or stroke. Plaque buildup in the legs does not always cause symptoms, so many people can have PAD and not know it. People who do experience symptoms, such as pain or cramping in the legs, often do not report them, believing they are a natural part of aging or due to another cause. In all, PAD affects 8 to 12 million people in the United States, especially those over 50. While women can also develop PAD–with or without any symptoms–the disease predominantly affects men. Smokers and ex-smokers alike have up to four times greater risk of developing PAD. One in every three people over the age of 50 with diabetes is likely to have PAD. Also known as hypertension, high blood pressure significantly raises the risk of developing plaque in the arteries. Have a personal history of vascular disease, heart attack, or stroke. If you have heart disease, you have a one in three chance of also having PAD. African Americans are more than twice as likely to have PAD as their white counterparts. Plaque buildup in the arteries. Fatigue, heaviness, tiredness, cramping in the leg muscles (buttocks, thigh, or calf) that occurs during activity such as walking or climbing stairs. This pain or discomfort goes away once the activity is stopped and during rest. Pain in the legs and/or feet that disturbs sleep. Sores or wounds on toes, feet, or legs that heal slowly, poorly, or not at all. A lower temperature in one leg compared to the other leg. It is vitally important to remember that many people with PAD do not experience ANY symptoms.